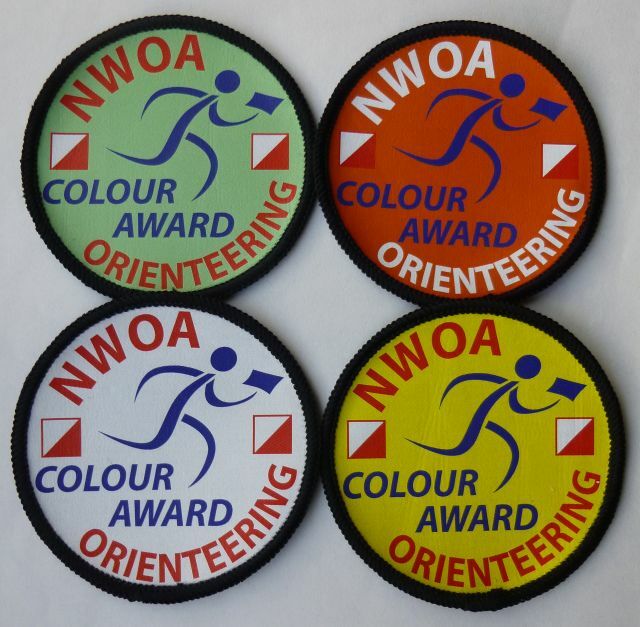 This is a scheme of awarding Colour Badges at Orienteering Events for newcomers of all ages. Beginners in Orienteering are welcome to any events - you will always find people willing to help, and advise you on which coloured course to enter. The ideal for Juniors is to begin by entering a WHITE course where the controls are on paths, then progress through to a YELLOW, ORANGE and eventually a LIGHT GREEN course. Adult newcomers may like to start on a YELLOW or ORANGE course. To qualify for your Colour Badge you must achieve colour standard in the same colour course at three different events. This qualifying standard does not apply to those Juniors entering the WHITE course, the requirement for this course is that they just complete three different White courses to receive their Badge. Your finishing time must be either the winner's time + 50% or in the top half of the course (including non-finishers) whichever produces the most number of qualifiers. The Colour Standards for the event will normally be published with the results, but in the unlikely event they are not you can work out the standard yourself and submit it with your claim to your club.